AS A2 Social Influence, Psychology - complete notes EVERYTHING you need to know for an A in psychology! Cheat sheet for all homework, essays and an in-depth revision guide for exams!! A collation of several textbooks, articles and my personal notes organised and colour-coded in a simple, easy-to-learn manner. Based off of the NEW 2015 AQA SPECIFICATION but can be of use to other exam boards. 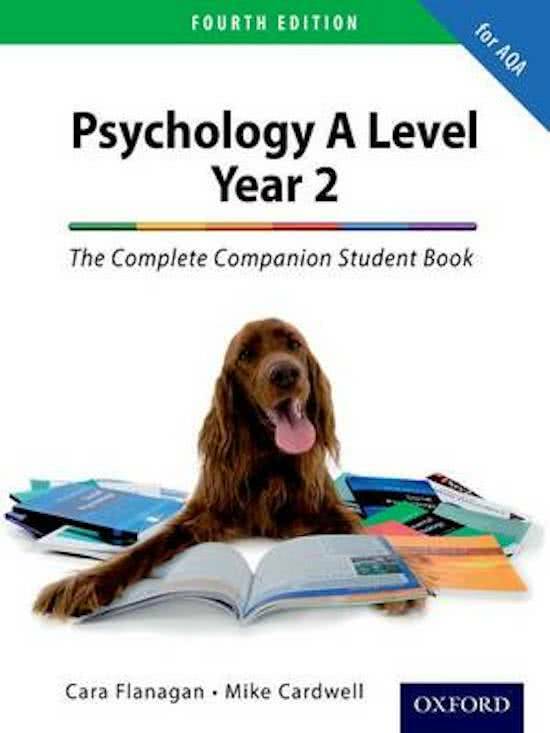 Auf dieser Seite findest du Zusammenfassungen, Mitschriebe, Arbeitshilfen und vieles mehr für das Lehrbuch The Complete Companion for AQA Psychology A Level. Die Zusammenfassungen wurden von Studenten persönlich geschrieben, was dir wiederum einen Einblick darin ermöglicht, was beim Studium dieses Buches besonders wichtig ist. Themen wie Psychology, AQA, AQA Psychology, Approaches, AS level, AS & A2 Biopsychology, AS & AQA Psychology - Schizophrenia werden behandelt.